You have good reason to be concerned. The basement seems damp, or you’re worried about roof damage from the last bad storm. It might be noises coming from the pipes or a musty smell in the laundry room. As home water damage restoration specialists, we understand. You want the peace of mind that comes from knowing how to detect water damage when it isn’t obvious. We can help. So many things can go wrong. There are so many sources for water damage inside and outside the house. When your homeowner’s intuition starts sounding the alarm, start looking for these ten early signs of water damage. Use a flashlight to inspect pipes under sinks and behind toilets. Often, hidden water damage in these areas shows up as corrosion around loose connections. The tiniest leak can ruin surrounding materials and drive up the water bill. Every appliance in the house is a suspect. Check the water heater, washing machine, dishwasher, garbage disposal and even the refrigerator. Look for worn hoses, leaks around water supplies and faulty pipe connections. Inspect appliance interiors too, and be sure to check your AC unit. Bare feet can quickly detect dampness in carpets, slight buckles in vinyl floor coverings and small warps in hardwood floors. These underlying problems often indicate deeper trouble like water-damaged subflooring. Water damage behind the walls isn’t always invisible. What might appear to be a dirty spot could be staining caused by a leaky pipe. Look for other telltale signs like blistered paint, peeling wallpaper and hairline cracks in the drywall. Check for water leaks around windows by running your hand over the trim. It may be dry to the touch, but regular exposure to water compromises the wood. If it crumbles or peels, surrounding materials are probably affected too. Stains are the most common signs of water damage in the ceiling, and they’re often caused by a clogged AC drip pan or a pipe leak in the attic. Bulges or buckling indicate serious problems that can result in a ceiling collapse. Call a restoration contractor right away. Water damage in the attic might be coming through the roof. If an attic inspection reveals moldy insulation or stains on supporting beams, check for leaks in the roof. Look for loose shingles and curled flashing. The porous nature of concrete can result in a wet basement. If you don’t have a moisture meter, test the walls with a plastic patch. This DIY trick can determine if damp basement walls are caused by exterior or interior problems. Take a walk outside the house, and take a close look at the foundation. Cracks and crumbling areas can be caused by interior plumbing leaks. Note the location of any damage, and compare your foundation inspection with the results of your basement wall test. Your sense of smell is one of your best tools for detecting water damage. Damp walls, floors and carpets give off a distinct odor that can lead you to leaking appliance hoses, dripping sink pipes and hidden plumbing problems. Once you find it, you’re ready to fix it, but how old is the problem? Age matters when you’re tackling DIY water damage repair. Look for these clues as you decide between doing it yourself and bringing in restoration pros. • Material Consistency – Older water damage leaves materials mushy to the touch. • Discolored Rings – Multiple, discolored stain rings are evidence of repeated soaking and drying. • Signs of Rot – Rotted baseboards, floors and framing result from extended water exposure. • Mold and Mildew – Mold on any surface indicates water damage that’s at least several days old. While we know you can handle most DIY projects around your home, our water damage restoration services are always available for backup. Regardless of the size or age of the problem, we can fix it. Our technicians handle everything from plumbing repairs and drywall replacement to mold removal and remediation. 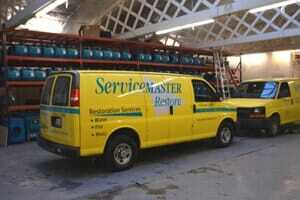 When you want help from the best in the restoration business, give us a call here at ServiceMaster by Zaba.